Hollywood – Journey into a world inspired by Hollywood Boulevard, where the buildings, mansions streets lined with palm trees replicate the original version and reflect the chic essence of the famous celebrity hotspot making you feel as if you are roaming at the real place itself. New York – Wander around the New York themed zone and feel the verve of America’s most vibrant city as you stroll around viewing New York’s iconic landmarks, remarkable city skyline, facades, subways and giant neon lit signage. 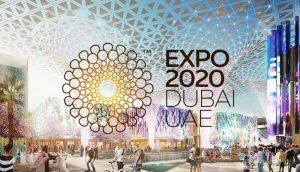 Sci-Fi City –The Sci-Fi City takes you through exciting futuristic experiences – a dynamic future metropolis that gives you a peek at how thrilling the future should feel with ultra modern conveniences and entertainment. Ancient Egypt – Setting the scene of bygone Egypt era, The Ancient Egypt zone lets you venture into the land of pyramids where obelisks, Pharaoh’s tombs and pyramids rule the scenario. Lost World -Travel back in time at Jurassic Park where Dinosaurs dominated the space or immerse yourself in amazement at Water World where death defying stunt shows and attractions look forward to to thrill you. Far Far Away – Mingle around with Shrek, Donkey and other favourite characters along with exciting rides and shows at this Shrek inspired theme land. 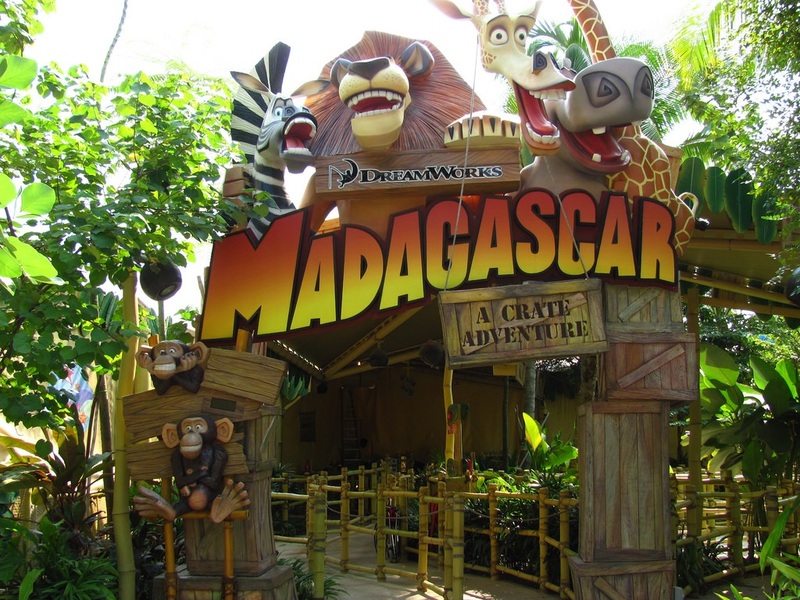 Get ready to groove around at tropical forest settings with the cast of Madagascar movie and encounter weird and wonderful animals, and exciting attractions. The enormous theme park made up of these seven zones sends you to a joyous place where merriment begins and ends amid movie magic and fun. Once inside the theme park, checkout these amazing experiences that guarantees a fun packed experience of a lifetime. Strap up and hold on to your seats as you climb up, scream as you hurl down, zoom through and swerve in excitement on heart thumping rollercoaster rides of Battlestar Galactica: Human vs. Cylon world’s tallest dueling rollercoasters, TRANSFORMERS The Ride a hyper-realistic 3D thrill ride and Revenge of the Mummy where you speed through labyrinth of darkness dodging warrior mummies and scarab beetles. 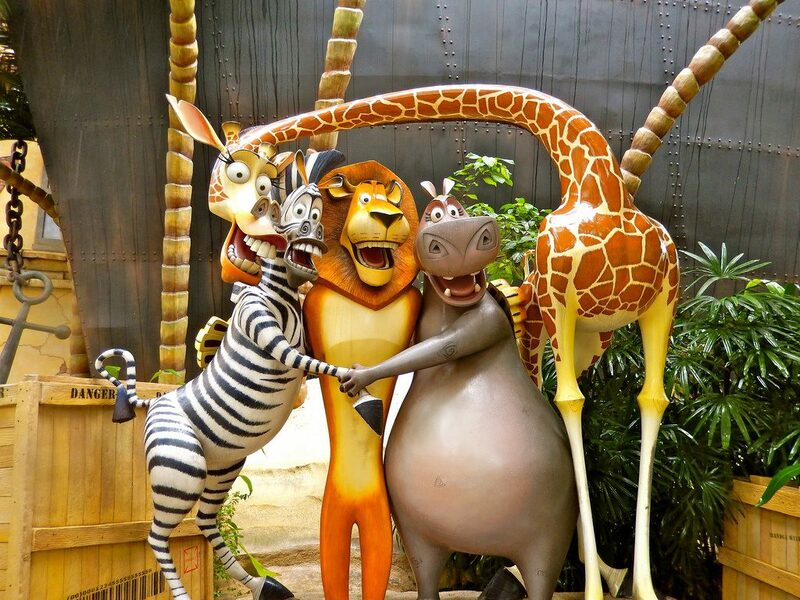 For milder thrill rides, hop on a riverboat ride with Alex, Marty, Melman and Gloria at Madagascar-A Crate Adventure, cruise on thrilling river currents through lush jungle spotting primeval dinosaurs at Jurassic Park Rapids Adventure. Get your dose of colossal entertainment unlike any other shows you have ever experienced before. Get a chance to join in on an adventure with your favourite characters from Shrek movie in Shrek 4-D Adventure. Brace yourselves as you find yourself amid a massive hurricane that dangerously tries to thwart the boathouse you are seated in at Lights, Camera, Action! hosted by Steven Spielberg. Go behind the scenes to catch the action of thrilling, pulsating death defying stunts at a sensational live water show at Water World. The excitement doubles up for kids who can come face to face with some of their favourite movie characters. Start the day with a scrumptious buffet meal along with hugs from some of Sesame Street’s best-loved characters, Strike a pose and shake hands with Sesame Street friends on the streets and sing along with them to favourite tunes at Sesame Street Stage Shows and Sesame Street Show-When I Grow up. Go on a thrilling rescue mission with Elmo and Super Grover on Sesame Street Spaghetti Space Chase ride. Want more fun? Explore the Egyptian desert on your own on a drive safari through an abandoned excavation site in Treasure Hunters, fly on the back of a Pteranodons at Dino-Soarin and get onboard the Enchanted airways for a fairy tale journey through the world of Shrek. Get a load of live street performances ready to entertain you in Universal Studios Singapore. While you wander in the theme parks, you will come across foot tapping dance and music as per the theme of the park you are in. You can shake a leg to the beats with performers at Mel’s Drive-In, watch Puss In Boots and Kitty Softpaws in a flamenco performance at Dance for the Magic Beans, or catch a performance on the streets of New York. This is equally thrilling for grownups as much as it is for kids. Get a chance to hug and click pictures with your favourite characters from movies and show. Run along and create havoc with the minions, enjoy sing alongs with Sesame street furry friends, strike a pose with the Autobots, Shrek, Fiona and the talking donkey. Take snaps with legendary characters of Universal Studio movies such as Marilyn Monroe, Woody Woodpecker at the Hollywood Walk of Fame. An exciting theme park should come with equally exhilarating food and Universal Studios Singapore promises the same to its guests. Get ready to sink your teeth into some delicious treats at an amazing array of restaurants and dining outlets. Hollywood China Bistro serves up quick tasty Chinese dim sums, noodles and rice dishes at Hollywood zone. You can also enjoy a drive in American meal at Mel’s Drive-In. At New York Zone, KT’s Grill lets you delve in mouthwatering English styled grilled streaks, try out authentic Italian dishes and pizzas at Louis NY Pizza Parlor, sample Middle Eastern cuisine at the Oasis Spice Café in Ancient Egypt Zone and Singapore’s ‘must have’ local delicacies in Discovery Food Court at Lost World. Relish lip smacking seafood baskets at Friar’s located at Far Far Away. Dig into a myriad of South East Asian cuisines at Martys Casa Del Wild Food Court and luscious selection of Japanese food at Gloria’s Snack Shack at Madagascar zone. An exuberant shopping experience awaits at the Universal Studio Stores and other shopping outlets offering oodles of exclusive Universal Studio themed collectibles, character merchandises, apparels and toys all up for sale inside each theme park zone. At the Minion mart, get exclusive range of Despicable Me themed goodies. 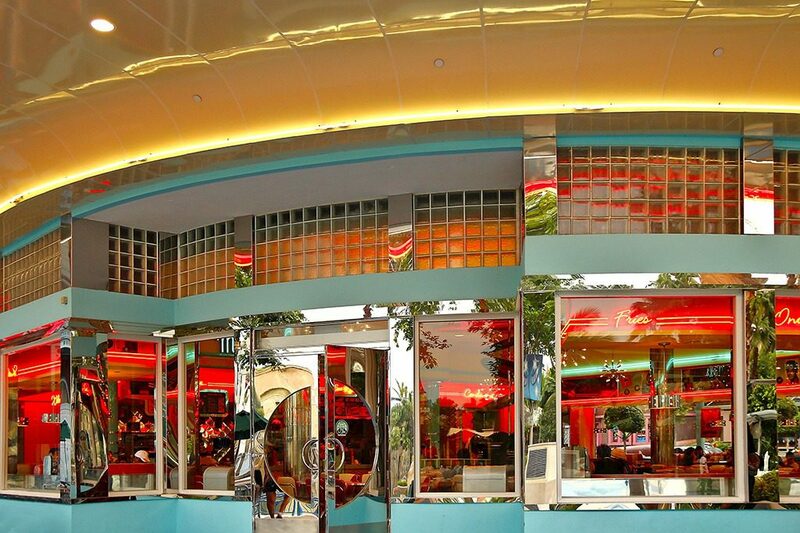 Just near to the Entrance Plaza is “That’s a Wrap” store showcasing a variety of souvenirs, toys and fun products. The biggest Sesame Street store in Singapore – Big Bird’s Emporium offers a wide range of themed products for kids as well as adults. Stop by Transformers Supply Vault for authentic Transformers toys and collectibles. Shop for exciting toys, games and goods themed on Shrek at Fairy Godmother’s Potion Shop and Madagascar characters keepsakes from Penguins Merchantile. With a dizzying collection of immense entertainment and impressive rides, recreation and appealing dining arenas, the attractions in Universal Studios Singapore enthralls visitors to leave behind reality and transport into a world reeling around their favourite fictional characters and movies. 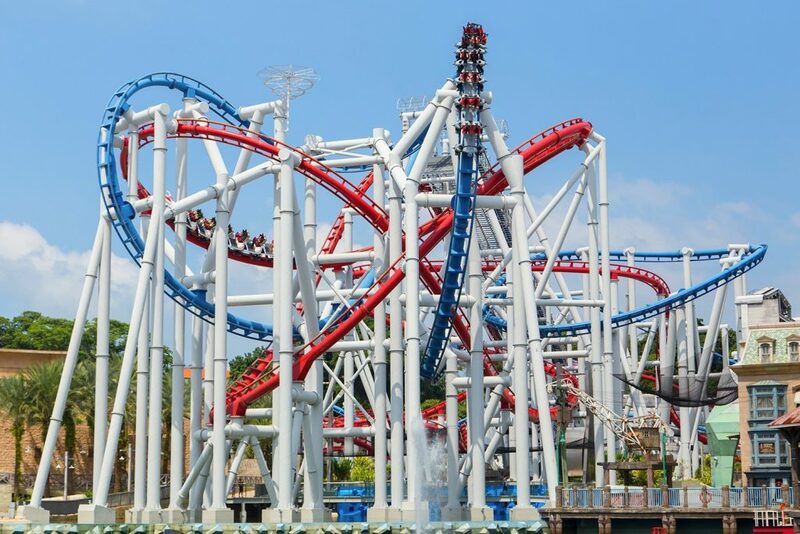 A Universal Studio Day Pass gets you unlimited access to all the attractions in the theme park for the whole day and costs around SG$75 per adult, S$ 55 per child and SG$ 35 for senior citizens. 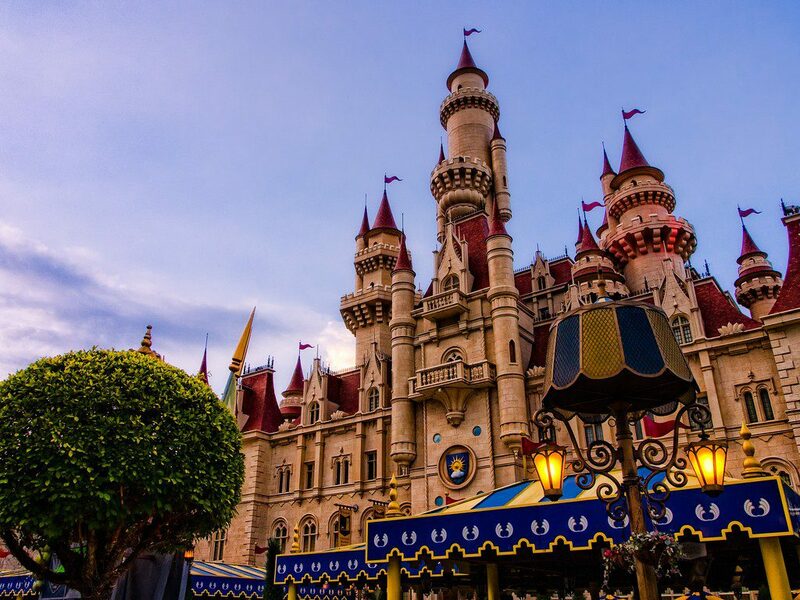 There are lots of things to do in Universal Studios Singapore and the theme park is usually crowded with rides have long queues, hence be sure to reach popular attractions earlier in the day. 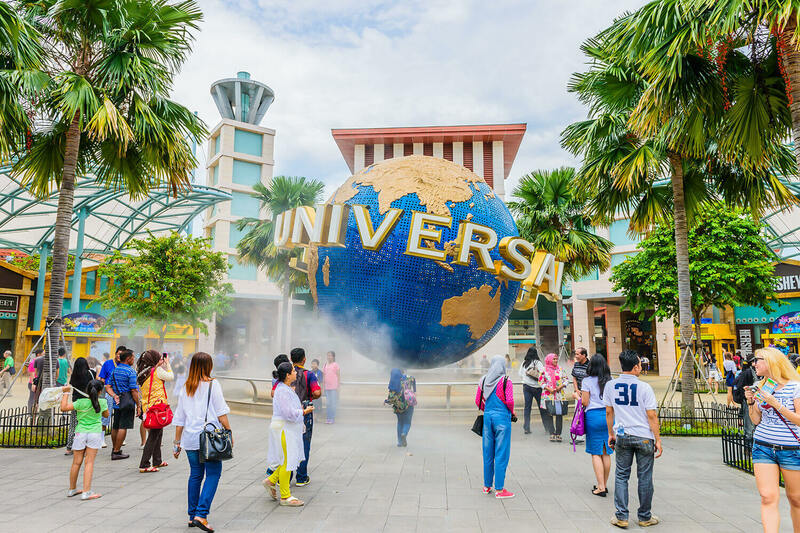 Book Singapore Holidays and spend a day at Universal Studios Singapore with your family for a guaranteed fun and adventure packed experience for all ages.